B. E. B.: Is it STILL January? FFS.. I am currently obsessed with two things; firstly, shirts, buttoned up to the top. I got this shirt last week. Its actually sleeveless so a bit too chilly for winter. Topshop do loads in all different colours and I can't decide which one to get next..
..possibly it may be the one which is my second obsession at the moment; bright orangey red, the colour my friend Holly likes to call 'KILLER TOMATO' The second picture is of my latest purchase from Jaeger (I had a press voucher, its way too pricey for me really). 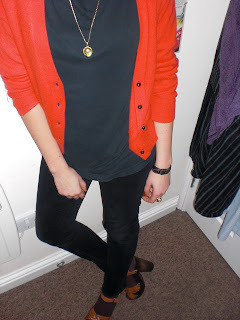 Killer Tomato is getting me through winter and the boring camel colour the high street is still obsessed with. When are they gonna cotton on to the fact no one looks good in beige. yep BEIGE. Doesn't sound so sartorial now does it?! I went out wearing heels for the first time in at least 5 years on Saturday (the H&M ones pictured) and my feet didn't hurt. I felt well tall!